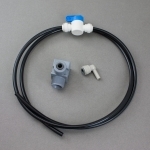 Shutoff valves, John Guest and Jaco Fittings, RO Tanks, Faucets, Filter Housings, Filter and Membrane Mounting Brackets, RO Tank Valves, Drain Saddles, Inlet Saddle Valves, Filter Wrenches, TDS Tester, Tubing, Flow Restrictors and much, much more. We stock a wide range of standard Reverse Osmosis parts and fittings. If you need help diagnosing an issue or selecting the correct replacement part please give us a call: (940) 382-3814. 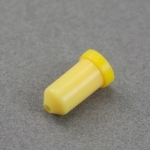 Note: For RO Membranes and Cartridges, go to our Cartridge Menu. 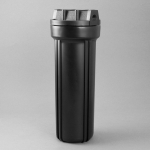 Standard filter housing for 2.5" x 9.75" cartridges. 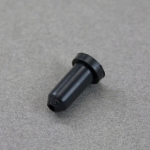 1/4" NPT threaded ports. Standard reverse osmosis membrane housing. 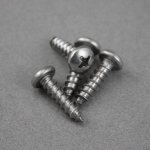 1/8" NPT threaded ports. Mounting bracket for 2 filter housings. 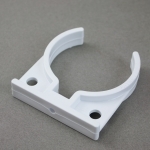 Mounting bracket for 3 filter housings. 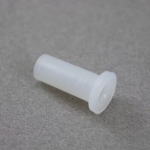 Contains four #10 Screws, 3/4" long, to mount filter housing to bracket. 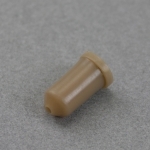 Use this set if you are attaching a housing without a membrane clip. 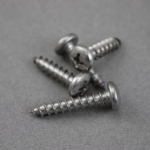 Consists of four screws: Three #10 Screws, 3/4" long, and one #10 Screw 1" long. 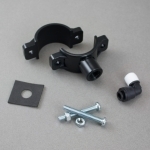 Use this packet to mount filter housing on bracket when one of the screws also holds a membrane clip. Jaco-style fittings, nuts included. Horseshoe flow pattern with In/Out on one side and Tank/Tank on the other. John Guest-style fittings. Horseshoe flow pattern with In/Out on one side and Tank/Tank on the other. Jaco-style fittings, nuts included. Has straight-through flow pattern. John Guest-style fittings. 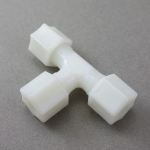 Has straight-through flow pattern. 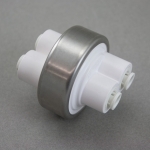 Fits filter housings, but not membrane housings. 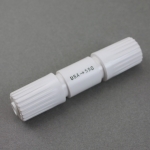 Can also be used for inline post filters. 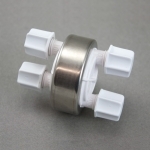 Fits filter housings and inline postfilters. 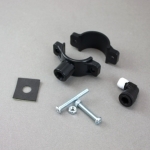 Fits membrane housings, making a straight connection rather than an elbow. 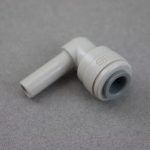 John Guest Union Tee, 1/4"
John Guest Union Tee, 3/8"
John Guest Plug-In Elbow, 1/4"
Plugs into a straight 1/4" John Guest fitting to make a swiveling elbow. 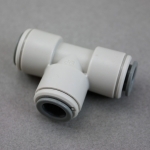 John Guest Plug-In Elbow, 3/8"
Plugs into a straight 3/8" John Guest fitting to make a swiveling elbow. 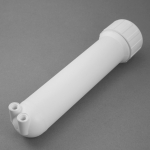 This fits most filter vessels, but not membrane housings. Can also be used for inline post filters. 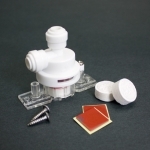 This fits most membrane housings, but not filter vessels. 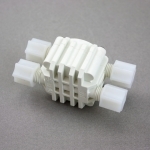 Fits filter housings and inline filters. 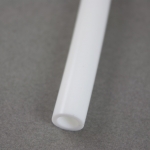 One foot of white 1/4" tubing. To order multiple feet, change quantity in shopping cart. 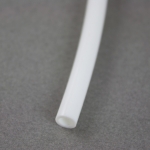 One foot of white 3/8" tubing. To order multiple feet, change quantity in shopping cart. 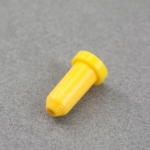 Jaco Fitting Tube Insert, 1/4"
Must use with Jaco fittings. Do not use with John Guest fittings. 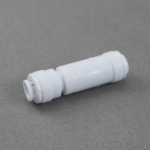 Jaco Fitting Tube Insert, 3/8"
Attaches membrane housing to the filter bracket. 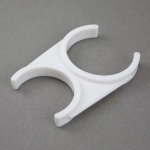 Most RO units use two membrane clips. 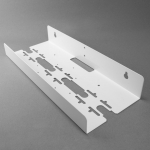 Attach standard 10" or 6" post filters to the membrane housing. Two clips are normally used for a filter. 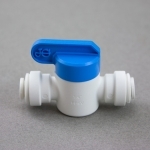 A single clip will attach a Payne shutoff valve (see above) to the membrane housing. More About Tanks and Tank Valves. 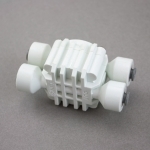 The tank valve is not included with tank, but can be ordered below. 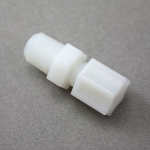 If you are replacing an existing tank, your present tank valve will fit our tank. 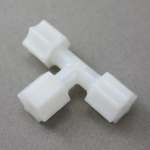 More RO tank sizes are available here. 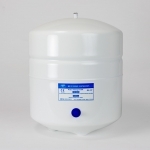 “4-Gallon” metal reverse osmosis storage tank. This is a standard-sized undersink tank. It is 11.5" in diameter by 14.5" from the floor to the top of the valve. John Guest RO Tank Valve, 1/4"
Fits all standard RO tanks. Connects to 1/4" tubing. John Guest RO Tank Valve, 3/8"
Fits all standard RO tanks. Connects to 3/8" tubing. Check Valve Discussion. 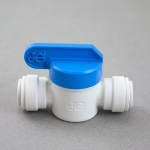 Check valves allow water to flow forward but not backward. Every RO unit has at least one, and we put two on our best units. 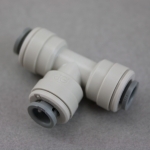 Inserts into 1/4" tubing with John Guest-style quick connect fittings. 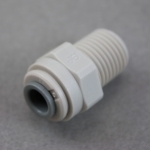 Inserts into 3/8" tubing with John Guest-style quick connect fittings. Insert into 1/4" Drain Line. The number indicates the flow rate, in milliliters per minute. 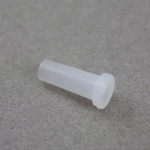 The flow restrictor should match your membrane's production rate. 200 millimeters per minute. Recommended for 18 gpd membrane. 250 millimeters per minute. Recommended for 25 gpd or 36 gpd membrane. 350 millimeters per minute. Recommended for 36 gpd membrane. 420 millimeters per minute. Recommended for 50 gpd membrane. 550 millimeters per minute. Recommended for 50 gpd or 75 gpd membrane. 800 millimeters per minute. Recommended for 75 gpd or 100 gpd membrane. 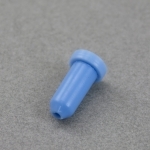 Inserts into either Jaco or John Guest membrane housing elbow with 1/8" threaded fitting. The number indicates the flow rate in gallons per day. 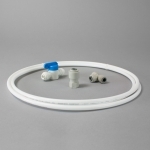 The gallon per day rating of a flow restrictor must be appropriate for, but not identical to the membrane's production rating. Recommended for a 10 gpd or 12 gpd membrane. Recommended for 50 gpd membrane. Recommended for 10 or 12 gpd membrane. Recommended for 18 gpd membrane. 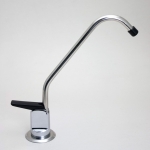 We carry several faucets that will replace the standard equipment faucet on any reverse osmosis unit, regardless of brand. 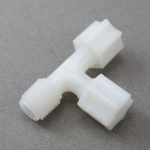 Below is our least expensive faucet, in ‘air gap’ style and in non-air gap. 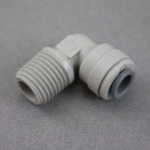 Go here for our full faucet list, as well as links to explanations and discussion of installation, the drilling of holes, the concept of the air gap faucet, and other grippingly interesting topics. 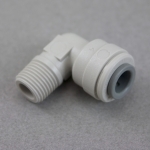 Use with 1/2" flexible water lines (typically, braided stainless steel). Connects to the upper end of the flexible line. 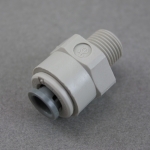 This adapter comes with inline valve (see jg039 below), plug-in elbow, and tubing. Everything you need to connect a 1/4" inlet line. 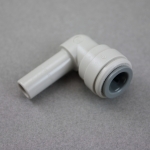 When installed, you can just push your 1/4" drain tubing into the fitting. If you prefer a Jaco-style fitting, let us know. The price is the same. 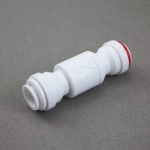 When installed, you can just push your 3/8" drain tubing into the fitting. If you prefer a Jaco-style fitting, let us know. The price is the same. 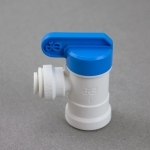 John Guest Inline Valve, 1/4"
Use as an inlet valve, a shutoff valve for the icemaker line, or anywhere an inline valve is needed. John Guest Inline Valve, 3/8"
HMDigital TDS Tester, measures 0 to 1000 parts per million total dissolved solids. A very handy tool for reverse osmosis owners; it tells you when your membrane needs replacement. 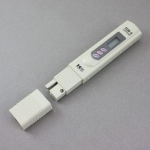 TDS Tester Discussion. 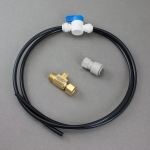 Consists of a John Guest tubing tee, a John Guest refrigerator connector, a John Guest inline valve, and enough 1/4" tubing to connect your RO unit to your refrigerator. When ordering, please tell us in the “comments” section how much tubing you'll need. 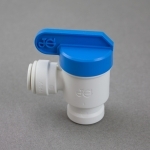 A unique leak prevention system from Watts that detects leaks and turns off the water supply when moisture is detected under the sink. Click here for info. 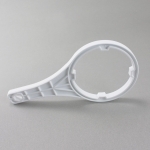 A solid plastic spanner wrench for opening and tightly closing Flowmatic 2.5" X 9.75" filter housings. 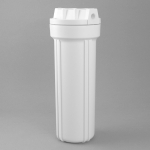 Fits our Countertop Filters, Undersink Filters, Reverse Osmosis Units, and Pura UV1 units. Low inlet pressure? See the Aquatec electric Booster Pumps & non-electric Permeate Pump. 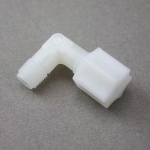 Air gap faucet problems? 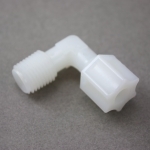 Take a look at our Air Gap Drain Adapter. 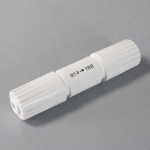 Filter Cartridges & Membranes for Standard, Hydrotech & Clack (Microline) RO units. 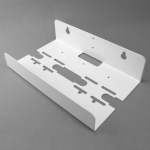 We stock all parts for standard RO units. If you don't see what you need on this page, give us a call (940) 382-3814.